Good morning. It's Tuesday, March 12. • A resurgence of medieval diseases among California's poor. • A plan to solve L.A.'s housing crunch with granny flats. • And the Central Coast escapes long-held grip of drought. 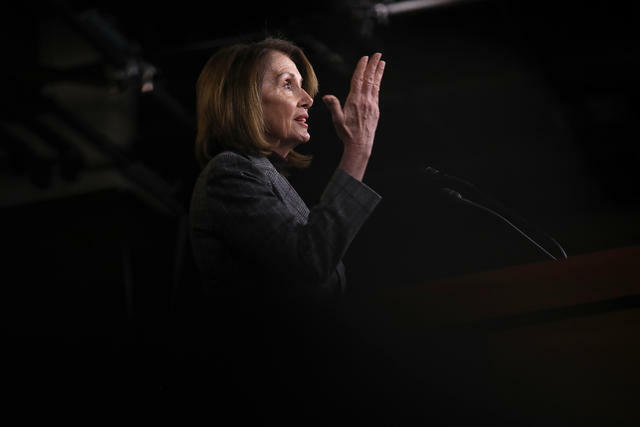 Speaker Nancy Pelosi spoke to reporters at the Capitol late last month. "He's just not worth it." That was Speaker Nancy Pelosi explaining why she opposed impeaching President Trump. In remarks likely to rankle the liberal rank-and-file, she told the Washington Post Magazine that the move would be too divisive. Yet when asked if Trump was fit to be president, she was blunt: "No. I don’t think he is. I mean, ethically unfit. Intellectually unfit. Curiosity-wise unfit." Medieval diseases are resurging among California's homeless. Downtown Los Angeles recently had an outbreak of typhus — spread by infected fleas on rats — and more than 1,000 people in Southern California have been stricken in the past two years by Hepatitis A — spread primarily through feces. "The hygiene situation is just horrendous," a physician said. "It becomes just like a Third World environment." 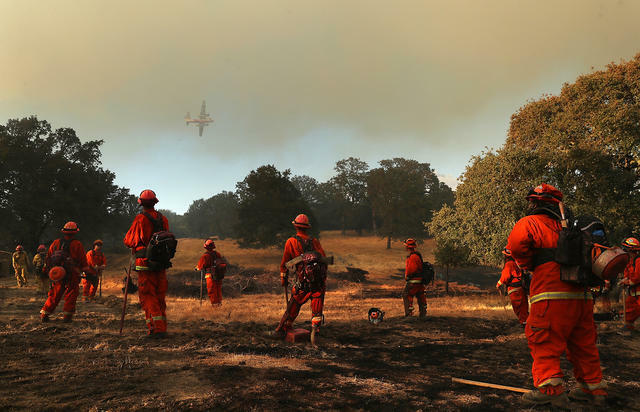 Inmate firefighters watched an aircraft prepare to drop fire retardant during the Mendocino Complex Fire in Lakeport last August. State lawmakers are pushing legislation to help inmate firefighters start a career in the field after release. California relies on prisoners to fight wildfires more than any other state — paying them roughly $2 a day. The state's largest firefighter union strongly opposes the new measure. "If a firefighter who was on the job was to do any of the things these incarcerated individuals have done, they would lose their jobs," a spokesman said. More than 79 percent of Californians are now registered to vote, the highest proportion since 1996, new data showed. The broad engagement suggests people are gearing up for the 2020 election fight. Another notable development: A sharp rise in the number of Californians choosing the label "no party preference," a bloc now larger than that of Republicans. Capital Public Radio | A.P. 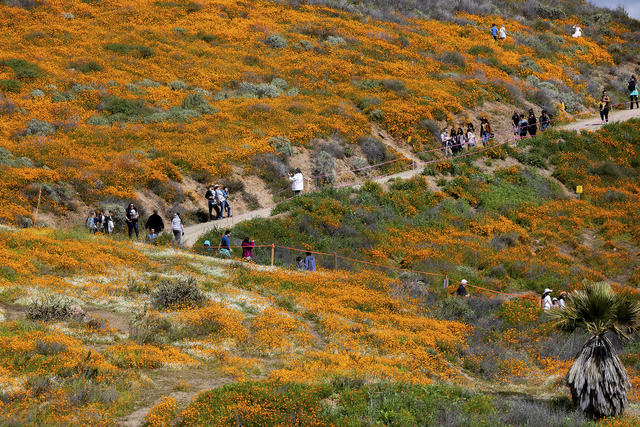 Visitors walked through a sea of poppies in Walker Canyon near Lake Elsinore over the weekend. The Super Bloom is on. Here's a collection of photos by the Associated Press from Borrego Springs — draped in yellows and purples — and another series by the Inland Valley Daily Bulletin captured near Lake Elsinore — where California poppies have blanketed the hills in a blaze of golden-orange. 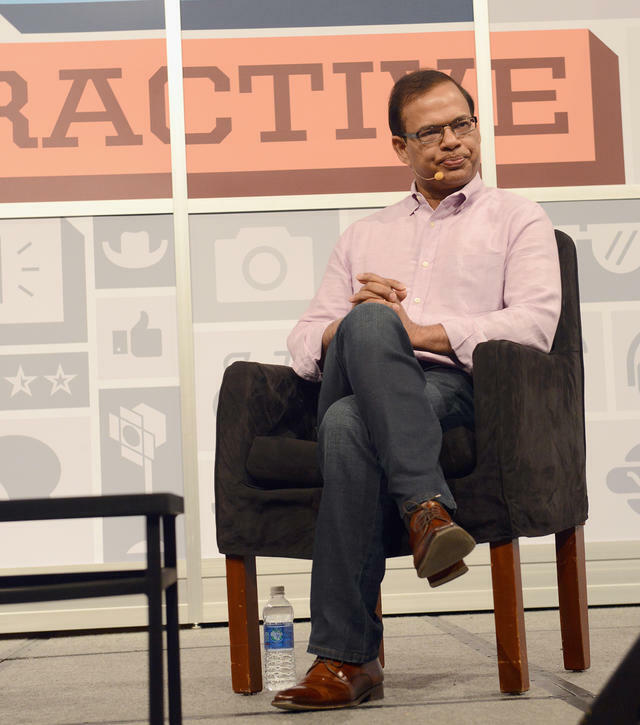 Alphabet agreed to pay Amit Singhal, who ran the search division, up to $45 million. Alphabet, Google's parent company, agreed to pay a former executive as much as $45 million when he resigned in 2016 amid allegations that he groped a subordinate. The company is facing a lawsuit from shareholders accusing it of shirking its responsibilities by paying executives accused of misconduct instead of firing them. Facebook blocked Sen. Elizabeth Warren's presidential campaign from running ads that called for breaking up Facebook and other tech giants. The social media giant later backtracked, saying it wanted to allow "robust debate." Warren could hardly have asked for a better demonstration of her point: "Curious why I think FB has too much power?" she later tweeted. Dudleya farinosa are now fashionable among the middle class in Asia. 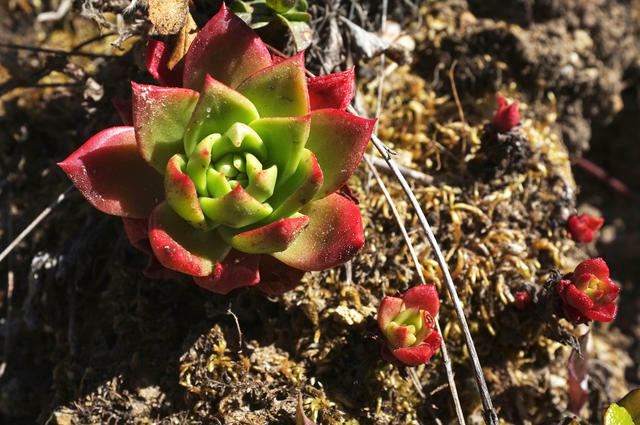 Investigators now believe that hundreds of thousands of succulents have been stripped from bluffs along the California coast, a haul worth tens of millions of dollars on the black market in Asia. Whole areas have been picked clean of the Dudleya farinosa plants. "It's like all of a sudden these were coveted, and then it just exploded," a state official said. Fresno County has been hit by an unusual crime wave: goat theft. More than 60 goats — valued at about $27,000 — have vanished in the last two months. The authorities think the heists are occurring under cover of night. Kristy Picquette, a Kingsburg resident, had 11 goats swiped. "I'm just heartbroken," she said. "I don't know if they're scared or hungry." 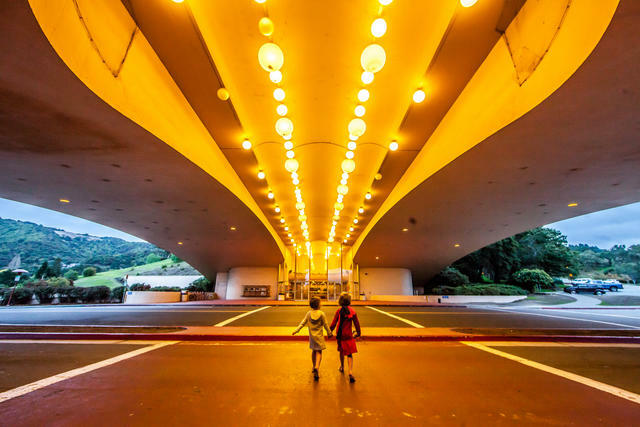 Here's a view of the Marin County Civic Center, Frank Lloyd Wright's last commission and his largest public project. It's a wonder that that the landmark was ever built. There was a dispute over the land, and Wright stormed out of a meeting after being accused of sympathizing with communists. But the planning continued, with Wright designing every last detail of the structure, including doorways and furniture. Sadly, he never saw the finished structure. He died in 1959, a few years before its completion. At the dedication, Wright's widow recalled his reaction when he saw first saw the land. "What a site, what a site," he said. "Wait until you see what I'm going to do with that site." Here's the story of how the center was built by the S.F. Chronicle, and a great collection of photos by Thomas Hawk on Flickr. Transportation officials pushing for a new toll road in Southern California turned to a consulting firm to create a multimillion-dollar public outreach campaign. But the spending of taxpayer dollars has raised alarms. A review by the L.A. Times found that an exorbitant $380,000 was budgeted to produce content for two small websites. One consultant was paid for working 28 hours a day. Others were paid $185 an hour to read the news. A paraglider off Torrey Pines in 2015. 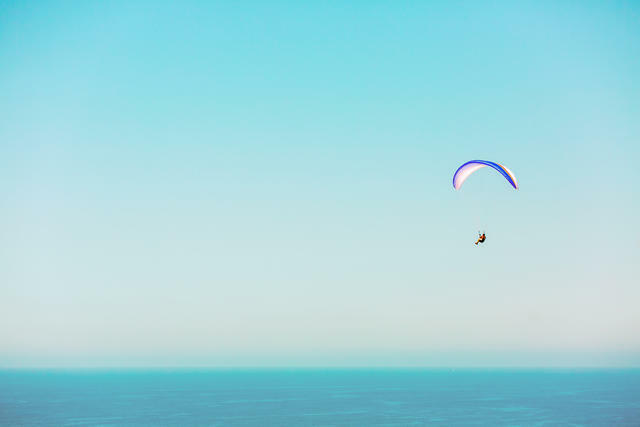 Two paragliders died along the coast of San Diego after they collided with each other in mid-air, sending them spiraling about about 75 feet to the earth. The accident happened at the Torrey Pines gliderport, a popular glider destination established in 1930. A county official said paragliding accidents were rare, with the last known death in 2012. In Los Angeles County, there are a quarter million detached two-car garages. Some think a solution to the region's affordable housing shortage could be in converting many of them into "granny flats," known as accessory dwelling units, under a 2017 law that streamlined the process. Proponents see it as a win-win: Rental income for the homeowner and affordable shelter for those in need. 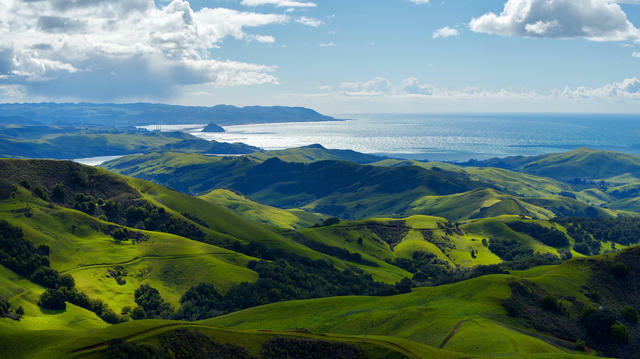 Another bonus of the rains: Luxuriant green hills, seen here from a vantage above Morro Bay. Even the Central Coast, one of California's most tenaciously dry regions, is now free of drought conditions after intense bouts of rain. The level at Lake Cachuma, Santa Barbara's primary water source, hit a low of 7 percent in 2016. The figure as of March: 63 percent. In the two months since January, Lake Nacimiento in San Luis Obispo County has risen from 11 percent to 81 percent. The Tribune has some great before-and-after satellite views of the region's watery transformation. 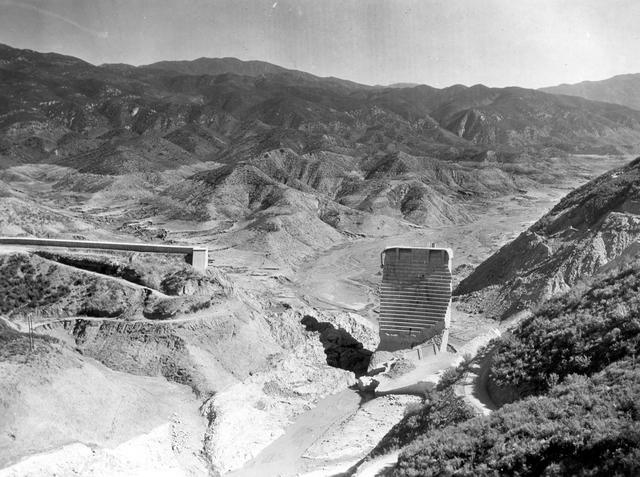 The ruins of St. Francis Dam in 1928. St. Francis Dam was a monument to California's engineering prowess until this day in 1928, when it burst and sent a wall of water barreling through the farming communities lining a valley north of Los Angeles. At least 400 people died in the state's deadliest man-made disaster. Yet many Californians, even near its ruins, are unaware it ever happened. That's expected to change under sweeping public lands legislation that includes plans to make St. Francis a national monument. President Trump has indicated he'll sign the measure, which would pave the way for a visitor center and public access to the site. "It's going to put us on the map," a local history buff told The Signal. "People across the country are going to know about it."